I'm thankful for volunteers in our community. Today was the annual Hermiston FFA Alumni auction, and from what I can tell - it was a huge success. Because of the generosity of our community, over $30,000 was raised to support FFA members. 1. The great volunteers who helped make it happen. There are too many to name, but you know who you are. 2. Businesses who were kind enough to donate items. 3. Individuals who came to the auction, ate dinner, bought raffles, bid on silent auction items and threw their hand up in the air during the silent auction. We had about 400 people at the auction, and Tom Spoo always does the meat....this year, like always - it was awesome. I helped prepare the sides for the meal this year, and I thought I had a pretty good handle on what I needed to do. But at 4:30 pm, I knew what I had hoped to be "orderly chaos" come 6:00 pm was just going to be chaos. Darn it. I never quite understand what the chefs on the show Top Chef meant when they would say "I was in the weeds." Now - I totally get it. Not a fun place to be. But - dinner was served, we only had a few short pauses in the dinner line, and for the most part, everyone enjoyed the food. Seriously - words can't thank you enough. 5. The Hermiston HS Catering Club - you guys rocked! 6. Lora, Shanna & Courtney - thanks for stepping in and lending a helping hand right when I needed it! 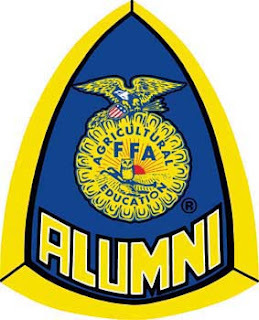 FFA is a great program, one that helped shape me as a person, and I'm so glad that so many other people are willing to help volunteer, bid, organize and support so that future FFA members can have the same opportunities I did.